Update: I sent out a draft of the first 115 pages to another wave of reviewers in early June. If you’d like to review this draft, just leave a comment on this post. You can find feedback on earlier drafts here. Thanks! After years of trying to make work more effective and fulfilling, I’ve discovered how to help people take control of their careers and lead more satisfying lives. It’s called “working out loud”. Working out loud is working in an open, generous, connected way so you can build a purposeful network, become more effective, and access more opportunities. The good news is that anyone can learn how to do it. The bad news is that most people find it too difficult to get started or to develop new habits that will allow them to realize the benefits. 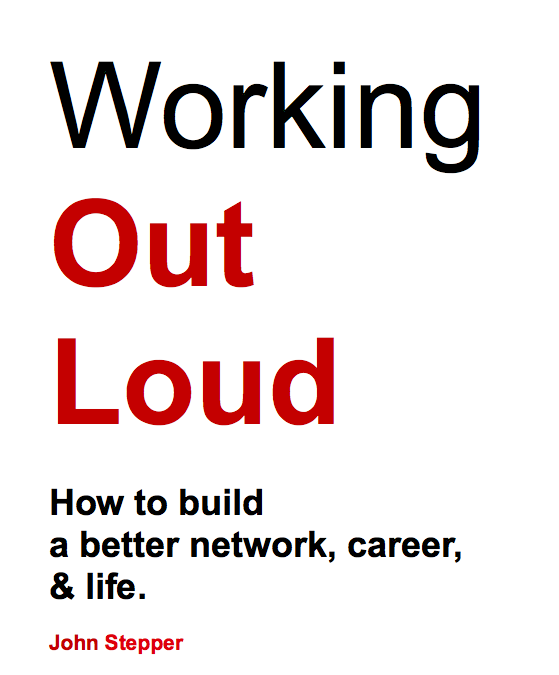 So, after 3 years of trying different tactics and refining my techniques, I’m writing a book called Working Out Loud, due out in September, 2014. In this post, I wanted to share why I’m writing it, what I hope to accomplish, and how you can contribute to it if you’d like. It took me a long time to realize that people needed more than presentations and blog posts to change. They needed help. Specifically, they needed help to do the things I was talking and writing about. And they needed help changing their habits so they could do those things regularly. That’s when I started coaching people. Beginning with a few individuals, I’d help them apply the 5 elements of working out loud every week for 12 weeks. The focus is on how to make your work visible and deepen relationships with some goal in mind, and how to do so with a mindset of generosity and personal development. Your goal might be a new job, more recognition, or simply exploring possibilities related to something you care about. There are no special tricks or anything to buy. It’s just a form of “guided mastery” for working in a more open and connected way. In addition to their successes, perhaps the thing that most shocks the people I coach is that they enjoy the process. Because they’re authentic and focused on contribution, there isn’t any of the bad aftertaste they’d previously experienced with networking. And, because they exercise their new habits week after week for 12 weeks, the changes stick and they can apply what they learned towards other goals. I see such positive change in the people I coach that I want to coach everyone I meet. People who’ve grown to hate working in dehumanizing corporations. People trying to start their own companies. People of all ages who are struggling to find jobs and, ideally, work that’s more than just a job. The book, if I get it right, will help people to help themselves and to help each other in small support groups. Originally, I thought the book might help my personal brand or even make money. But those turned out to be bad motivations to write and, as a result, I didn’t make much progress. As I coached more people, though, it became clear that the book wasn’t about me but about helping others. And then I felt I had to publish it. So, in addition to coaching, I started devoting more early mornings and weekends to writing. All proceeds will go to donorschoose.org and education causes around the world. I’ll self-publish the book to maximize the contribution. Working Out Loud will be generally available in September as a paperback and an e-book. In the spirit of Working Out Loud, I’m sharing drafts of the book with people interested in the topic. About 30 people have commented on the first 80 pages, offering feedback on flow, style, grammar, and even the subtitle. (One person suggested “A guide to a fulfilling life in the knowledge economy.”) A few support groups are also forming and they’ll test the material by using it in their own 12-week programs. If you’d like to review the next draft, just leave a comment on this post. You can also receive techniques and exercises related to Working Out Loud by visiting johnstepper.com and subscribing by email. There is no doubt in my mind that all of us can work out loud and improve our chances of making work and life more fulfilling and meaningful. After all, the magic my friend referred to has little to do with me. She – and you – have the magic inside you before reading the book. I’m just helping you make it visible so more people can see it. Hi John, I would love to be a beta reader for your book. Thank you, Lisette. I’ll send you a draft after the next rewrite (within 2 weeks-ish). The comments from the current reviewers have definitely made the book much better. I appreciate your time and look forward to you feedback. My colleague, Elinor, and I are also writing a book – it’s about companies who are doing great things while working remotely (“Collaboration Superpowers:The Remote Field Guide”). I was wondering if you’d be interested in doing a Hangout on Air interview with me to discuss the concept of working out loud more in depth? Along with the video interview, we would feature the interview write-up in the book (everything can be reviewed by you before publishing, of course). Here are some samples of other interviews I’ve done: http://www.lisettesutherland.com/interviews/ (the one-on-one interviews are towards the bottom – the other group interviews are discussions I’ve moderated on various topics around workplace happiness). Fantastic! I love your title. I’d like to talk with you. Maybe in 2 weeks after a bit of travel I have planned? You can contact me on Twitter and we can arrange something. And I’m already looking forward to your feedback in the list. Will send you a draft after the next rewrite. Thank you, Lisette! Would love to provide feedback. Your summary of the book has elements close to my own view of the work world and how it might improve! And I love a good book. Thank you, Andrea. That’s great. I hope to incorporate the current wave of feedback and do a rewrite within 2 weeks. You’ll also get some new material so your comments will definitely make the book better. John, so great to watch your motivation coalesce in this manner and around such an important contribution to the lives of many. Even without ever coaching me, you’ve helped me a great deal over the last few years so I’d be happy and honoured to help you deliver on this promise to yourself and us. A belated thank you, Dave! Your comments are truly a source of inspiration for me. You help me to feel that I *have* to write this book. Will send you a draft after the next rewrite. I really need help with Part III (the “how to” part based on the coaching I’m doing) so it’s practical without being boring. John: I’d be happy to be a beta reader and provide useful feedback. There’s such interest in this topic in big enterprises, especially for a practical “how to” process. Thank you, Lois! I’ll send you a draft after the next re-write. I’m struggling with Part III. Your comments will make the book better. I’m finishing a book, too. When I get stuck, I try to think about how I’d talk to a person and explain the ideas. Sometimes helps. Other times I just slam down all the points that I want to share and don’t worry about the text for a few days. Fazal!!! I had no idea you were a reader. How nice. I will absolutely send you a draft after the next rewrite. Thank you for generously offering to read it. Hi John, if there is room for one more beta reader, I would like to volunteer. thanks. Thank you for your generous offer, Tanaz. I’ll ship you a copy of the draft after the next rewrite. Hi John – I’m writing a book myself so I know exactly what it’s like! 🙂 Good luck with the writing – and I look forward to being a beta reader whenever you are ready. Simon! How nice to see you here! I’d be thrilled if you’d read the draft and help make it better. Will send you a new draft after I’ve finished a rewrite. I had 25 pages of fantastic comments from the first wave of reviewers so some of the more obvious problems with the book have been fixed. Part II is new, though, and feedback on that in particular will really shape it. I would be happy to volunteer as well if needed. Regards. I’ve put you on the list of future reviewers. Thanks very much for offering. Hey John – I’d love to read this book. I think that given your work life at DB I’d like to benefit from your appreciation of the balance between WOL and the need for client confidentiality and respect for regulatory issues – your insights will be a useful guide in how to WOL (a new verb?!) and still be professionally responsible. Nice seeing you with Guy Kawasaki on Twitter today. Though I do pref the pic of your encounter with Seth. Wishing you good energy in completing the book! Thank you, Christopher. Hope to get you a signed copy in September! That would be amazing 🙂 Let me know when pre-order is available please. “Let me know when pre-order is available” = music to a self-publishing author’s ears. 🙂 Thank you. I know it must be. I am writing something too but I am pre-publishing state with uncertainty on completion probability. Hi John, Saw your presentation at Gartner this week – great insights! Would love to read the draft of the book! Thank you, Alex! Will send you a draft once the next rewrite is complete. I really appreciate you offering to read it. Hi John. I stumbled on your site by accident, and glad that I did! Your quest is an interesting one and I share some of the concerns you expressed regarding fulfilment of one’s job/career. In your comments, you mentioned that you’re currently focused on the ‘How to’ portion, which I think is the most exciting! Should you have need of another beta reader, I’d be glad to. Otherwise, i’ll eagerly await your final release. Thank you, Soon Min! I will add you to the list of people reviewing the next draft. It will include some of the how to sections so your feedback will really help. Hi John. We haven’t yet met, but I lead Talent Analytics at Sears. I am setting up a research partnership with Northwestern/Kellogg through Deborah Weiss and Nicola Persico as part of the Workforce Science Project. Deborah sings your praises and – from reading your posts – I can see why! The whole premise of “Working Out Loud” and making work more meaningful really resonates with big changes we are making in HR here at Sears…Namely, transforming HR’s role from intercessor to personal enabler. If you have room for another reviewer, I’d be more than willing. Thanks! That’s a lovely comment, Ian. Thank you. Will send you the next draft. If you ever want to talk more about working out loud or some other topic that would help Sears, let’s meet. John, appreciate your crowd reviewing approach, a nice display of working out loud. Since subscribing to your blog I have retweeted and forwarded several of your blogs. The eclectic range of topics increasingly makes me wonder what the next focus is. One of the further reasons for appreciating working out loud is that it has helped me demystify emergence as I describe what i am doing or seeing when ‘trusting the process’. The step to show your own vulnerability has also helped training mates / colleagues address the transfer gap as they start explaining what they are doing. Thank you, Ru. As much as I know successful blogs are more narrowly thematic than mine, I can’t seem to help myself. “Eclectic” is a polite way to describe it. “Emergence” describes how I feel about my writing and what it’s led to in my life. My next focus is to be more focused. The book and the coaching related to it are the most creative and interesting experiences I’ve had to date. So I’ll keep coaching, writing, and learning with the aim of helping more people. You might see the occasional post about new habits or ways of looking at things. (My new habits are meditation and yoga – yum!) But my sense of having a personal mission to help people take control of their careers and lives will increasingly dominate my own work and life. John, pls. add me to your list of reviewers. I would be happy to help any way I can. Terrific. Thank you, Ken! I’m sending out a copy of the latest draft to all the people who commented here. Thank you for making the book better. John, would love to review the early draft. I’m someone who is open to new ideas, think I work out loud a little, trying to change the way people work but probably need to be a little louder. Fantastic! I’ll send it now. Thank you, Andrew! Thank you, Xavier! I’ll send you a draft now. Even one suggestion for making the book better would be helpful. Maybe by end of June or even early July? All of it could be better. I’m most uncertain about how I’ve written the How-To part (the last 3 chapters in this draft). Hi again, John. Even though I am not a native speaker, I would be happy to supply you with feedback on any drafts prior to publishing. I forgot to mention that before because I thought it goes without saying but just wanted to make sure you know. The draft is on its way. Thanks, Christopher! Hi John, I would lovely to read the early draft. As a US company doing IT outsourcing in China, we have quite big challenges in working out loudly due to the language barrier and more from the culture difference. However, it’s a compelling demand for us not only for building partnership across the locations and also for speeding up to value. I hope your book will provide good insights on this, I’m happy to provide feedback.